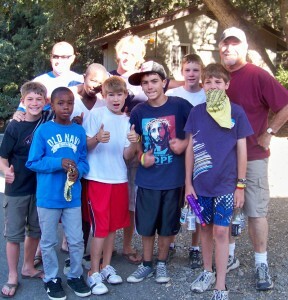 Last week I accompanied the middle-school group from our church to summer camp at Forest Home. I really can’t remember the last time I spent a week with a group of junior high boys as a cabin counselor, but the sounds, the smells (especially the smells), the cabin discussions … they all felt strangely familiar to me. It was a good week. The kids really had a blast and I enjoyed very much watching my son Nate (who directs the junior high camps at Forest Home) at work. Later this year, he and I are going to do a seminar on camping at the YS National Youth Workers Convention, so it was helpful for me to observe and be part of an actual summer camp program at least once this year. I used to do quite a few camps, either leading them or speaking at them … but that was a long time ago. I was very proud of Nate … he was the camp speaker and did a great job. I know my presence there made him a bit uncomfortable but he persevered and from all I heard, the kids responded well to his messages. I was also impressed with the team of leaders Nate assembled to run all the activities and programs. By my count there were more than a dozen staff. It amazes me that we used to run those camps with a staff of four. Times have definitely changed. Meanwhile … back at home … we are still living in a hotel room, now into our fourth month. The restoration company has held our stuff hostage waiting for insurance money. This has been the most difficult experience I’ve gone through since my wife’s brain tumor almost ten years ago. We are praying that maybe this week we will be able to return home. This entry was posted in Ministry, Our Children, Personal, Uncategorized and tagged Forest Home, house fire, middle schoolers, Ministry, Nathan Rice, summer camp. Bookmark the permalink. Thanks Wayne for your good words. I would agree that staffing levels have definitely changed. Also, a big thanks for your ministry every Thursday at Family Camp. Each week I hear from folks how helpful your insights have been. Hope the “dust” settles soon on your home situation. See you Thursday.